African Extracts Rooibos Herbal Extract Shampoo and Conditioner, both R39.99 – We all know that Rooibos has many benefits. This shampoo will cleanse without stripping your hair while the conditioner will leave it nourished and moisturised without the weight. Marc Anthony Easy-Lites, R119.95 – If you are confident enough to highlight your hair at home then Marc Anthony brings you Easy-Lites. You simply spray and flat iron the colour in. Avoid the regrowth and save yourself a trip to the hairdresser until you have some more moola. Organix Shimmering Keratin Oil, R159.99 – Run out of your favourite hair oil? The new Organix hair range will have you sorted in one spray! With coconut oil, avocado oil and cocoa butter this might be your new favourite. TRESemmé Instant Refresh Dry Shampoo, R71.99 – No time to wash and blow dry your hair for that important meeting? Give TRESemmé Dry Shampoo a go. You can instantly banish any traces of “dirty” hair in a matter of seconds and you will be ready to face the world. Alberto V05 Firm Hold Hairspray, R42.99 – Just because you’ve blown the bank doesn’t mean you can’t make your hair look nice. Give it some hold with a bit of hairspray. You will feel like a million bucks! I use the African Extracts facial products (cleanser, scrub, toner, day cream and night cream), I am definitely in love with this brand,so I am keen to try this on my hair. The problem is I have had the Brazillian done and it doesn’t mention the Sulphate content ? I had no idea that African Extracts do hair products as well. I’m curious to know if it smells just as delicious as the rest of their range. Great products! 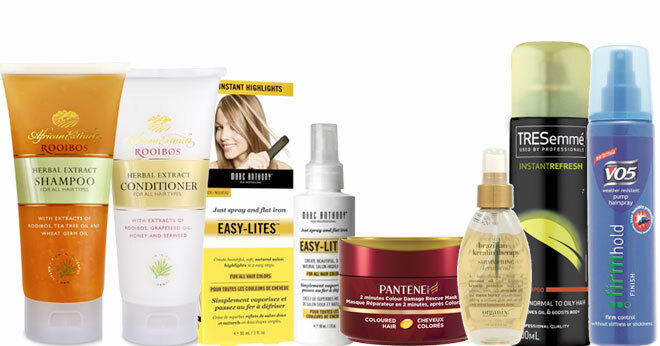 I would love to try the African Extracts products since I haven’t used them before. You can find Organix products from Dis-Chem stores. African Extracts Rooibos products smell really great and is quite beneficial. Will give this a try. where can we get the Organix products from? Dry shampoo is a must have!! Can’t imagine the days without it!! The Pantene masque is also very great!! Really makes your hair silky soft!